Design © Connie G. Barwick, licensed to About.com, Inc. Six Stitch Tall Cross Stitch Alphabet Pattern. Design © Connie G. Barwick, licensed to About.com, Inc. Chart a favorite saying or stitch an alphabet sampler. Use the links below to find sayings to stitch or quotes for Cross Stitch cards. Stitch this alphabet with the floss color of your choice using two-three strands of floss for cross stitch. For larger count fabric, increase the number of strands of floss as needed. Design © Connie G. Barwick, licensed to About.com, Inc. 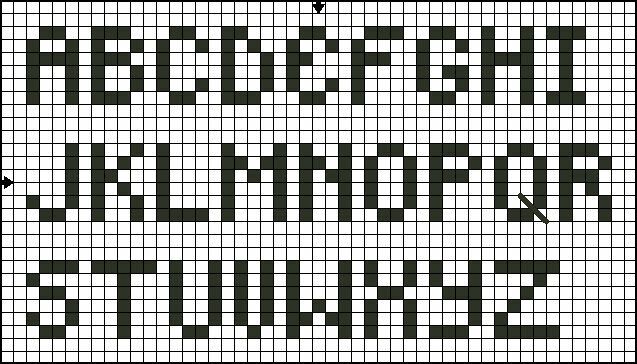 Eight Stitch Tall Alphabet Cross Stitch Pattern. Design © Connie G. Barwick, licensed to About.com, Inc.
Design © Connie G. Barwick, licensed to About.com, Inc. Six Stitch Tall Back Stitch Alphabet Pattern. Design © Connie G. Barwick, licensed to About.com, Inc.
Stitch this alphabet with the floss color of your choice using one-two strands of floss for back stitch. For larger count fabric, increase the number of strands of floss as needed. Design © Connie G. Barwick, licensed to About.com Lowercase Back Stitch Alphabet Pattern. Design © Connie G. Barwick, licensed to About.com, Inc. Designed to be a companion to the Six-Stitch Tall Back Stitch Alphabet Chart. Stitch this alphabet with the floss color of your choice. Use one-two strands of floss for back stitch. For larger count fabric, increase the number of strands of floss as needed. Design © Connie G. Barwick, licensed to About.com, Inc. Free Back Stitch Uppercase Cursive Alphabet Chart. Design © Connie G. Barwick, licensed to About.com, Inc.
Design © Connie G. Barwick, licensed to About.com, Inc. Free Lowercase Back Stitch Alphabet Pattern. Lowercase Back Stitch Alphabet Design © Connie G. Barwick, licensed to About.com, Inc.
Design © Connie G. Barwick, licensed to About.com, Inc. Two Stitches High Back Stitch Alphabet Pattern. Design © Connie G. Barwick, licensed to About.com, Inc.
Design © Connie G. Barwick, licensed to About.com, Inc. Itty Bitty Alphabet Chart. Design © Connie G. Barwick, licensed to About.com, Inc.
Stitch this alphabet with the floss color of your choice using one-two strands of floss for back stitch. Depending on the fabric count, alter the number of strands of floss as needed. Design © Connie G. Barwick, licensed to About.com, Inc. Tiny Alphabet Back Stitch Pattern - Upper and Lower Case Letters. Design © Connie G. Barwick, licensed to About.com, Inc.
Design © Connie G. Barwick, licensed to About.com, Inc. Four Stitch High Alphabet and Numbers Back Stitch Graph. Design © Connie G. Barwick, licensed to About.com, Inc.